Chicago aldermen are caught up in some questionable or unscrupulous behavior, as the campaign for mayor gets down and dirty. Carol Marin, Paris Schutz and Amanda Vinicky have details in this week’s Spotlight Politics roundtable. Aldermen who are not facing some sort of scrutiny are an anomaly these days in City Hall. This week, a bizarre story reported by WGN revealed that 1st Ward Ald. Proco “Joe” Moreno had reported his car stolen a month ago, only to admit that he had lent it out to a friend he used to date. The friend was arrested early Monday and charged with criminal trespass, but the charges were eventually dropped by the state after the news report appeared, leading Chicago police officials to question the case. The CPD says it is now investigating whether or not Moreno filed a false police report, especially in light of text messages showing him playfully interacting with his friend, even as she still supposedly had his car. And more unflattering revelations about Ald. Ed Burke are seeing the light of day, thanks to his nemesis, U.S. Rep. Jesus “Chuy” Garcia. Garcia is accusing Burke of electioneering at a polling place during last November’s general election. A cellphone video shared with “Chicago Tonight” shows Burke handing out bags with his name on it. Poll workers can be seen asking Burke to stop because campaigning is illegal inside Chicago polling places. Garcia also says Burke and others were getting people to sign petitions at polling places for his run for alderman in this month’s municipal election. The Chicago Board of Elections confirms that it received multiple complaints of campaigning in the 14th Ward, and sent investigators to shut it down. Board spokesperson Jim Allen says Burke and associates would leave one precinct when asked to, only to show up at another precinct doing the same thing. Garcia has called for further investigation, but Allen says there is really no discipline the board can level, since Burke didn’t disobey the investigator’s orders when confronted. Burke is under federal investigation and currently is facing one charge of attempted extortion for his role in an alleged scheme to shake down a fast food franchisee for business with his private law practice. He faces two election challengers in the Feb. 26 election. 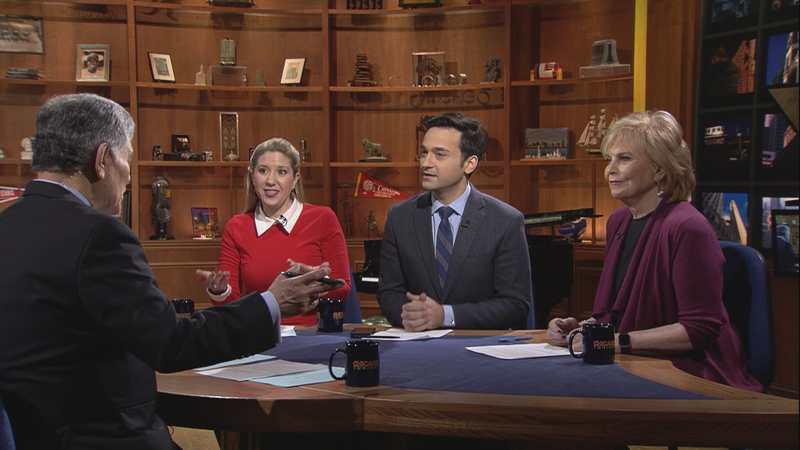 Lastly, there are hundreds of policy proposals from Chicago’s mayoral candidates on a wide range of subjects, but one off-the-wall idea made news at a Chicago Sun-Times candidate forum. Former Police Superintendent Garry McCarthy floated the idea of having Chicago annex suburbs like Evergreen Park, Schiller Park, Oak Lawn and Norridge. He says annexation would help expand the city’s tax base and appeal to residents of municipalities with higher property taxes. But state law makes it difficult for annexation to happen. Residents of those suburbs would have to weigh in on binding referenda, something that there’s little if any appetite for.